Antica Tenuta le Piane is in the heart of Marche Region. Closest town are Amandola e Sarnano. la Tenuta is within easy reach of many centres of artistic and culture interest. 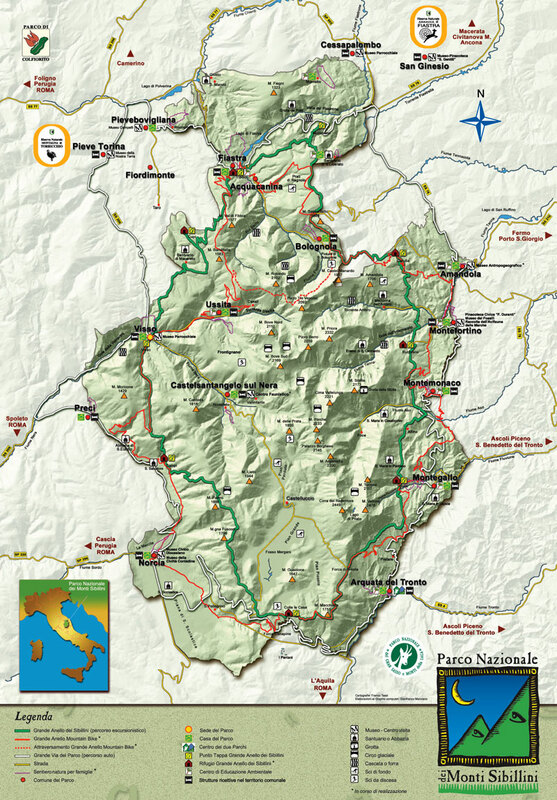 The Sibillini Mountains National Park cover over 70 thousand hectares and straddle between Umbria and Le Marche. The Park was founded in 1993. It is characterized by the presence of many peaks over 2000metres high, of which the highest is Mount Vettore (2,476metres). On the eastern flanks of the mountains, in Le Marche, there are the valleys of the rivers Aso, Tenna and Ambro, that together with Nera on the west form the river system of the Park. There are also two lakes, Fiastra (an artificial lake) and Pilato, found at 1940metres above sea level, below the summit of Mount Vettore. There is a rich abundance of different varieties of trees, including turkey oaks, moutain maple, chestnut, holm oaks and beech. There are fifty different species of mammals, including wolves, porcupines, martens, snow voles as well as the roe deer, reintroduced to the park in recent years. There are 150 different species of birds, including the royal eagle, pelegrine falcon, barn owl, sparrowhawk, woodpecker and alpine chaffinch. There are walking guides in the area available to lead parties on longer walks into the mountains. For those who love skiing the ski slopes of Sarnano-Sassotetto are just 15km away from Tenuta. There are seven slopes suitable for skiers of all levels, with new lifts. On the opposite side of Sibillini Mountains, in Umbria, there are slopes in Ussita-Frontignano, with 14 km of slopes. - Swimming. For lovers of swimming there is a 25metre covered swimming pool 6km away in Sarnano. - Tennis. Courts are in both Amandola and Sarnano, 6 km far. - Horse riding. is available at the stables “Le Querce”, only 10km away from Tenuta. - Biking. The owners have mountains bikes available for guests who would like to explore the mountain roads and paths around Tenuta. - Golf. In Petriolo there is a golf court with 9 holes, 25 km far. The Thermal Baths were established in Sarnano in 1933. The different cures available include inhalation, bathing in the sulphuric waters and mud baths, as well as beauty treatments and rehabilitative treatments. The water rises in three different places: La Terro, with suphuric waters, is recommended for ear nose and throat conditions, respirator, skin conditions, gynacological, gastric and liver disease. The other two (Saint Jacon and The Three Saints) provide bicarbonated lime water which is recommended for digestive problems, liver problems and kidney conditions. The Thermal Baths are in Viale Baglioni 14 in Sarnano (telephone 0733/657274, fax 0733/658290). In the summer guests at Tenuta can enjoy the “green Riviera of the Piceno”, the beautifully appointed beaches that line the Adriatic. The nearest are Porto San Giorgio and Pedaso, approximately 50km away, accessed by the state roads 210 and 433. Porto San Giorgio has the added advantage of being a Blue Ribbon beach, which recognises not only the healthy condition of the sea but also acknowledges the attention to the local environment and the development of sustainable tourist facilities. Less than 80km away is the town of San Benedetto del Tronto, the most important of the towns along the Marche Riviera, with its fabulous “Riviera of Palms”. Antica Tenuta le Piane is in the heart of Marche Region. Closest town are Amandola e Sarnano. Due to its position at the meeting point of the three provinces, Ascoli, Macerata and Fermo, la Tenuta is within easy reach of many centres of artistic and culture interest. The food of the area of the Sibillini National Park combines the flavours of the farming area with the art of curing pork. The most important cheese of the area is pecorino, but ricotte (fresh and seasoned) can also be found, and, less commonly, goats cheese and other cheeses of mixed origins. The area is famous for its extraordinary salamis, sausages and hams. Amongst other products of the area it offers a variety of apples, truffles, mushrooms, chestnuts, chick peas and broad beans. There are excellent honeys as well as wood-baked bread and pastries. There are two excellent locally produced liqueurs, Mistra and Vin Cotto. Faleria of Colli Ascolani, the Rosso Piceno and the fizzy red Vernaccia of Serrapetrona.